Today the Cadets announced that in 2009, the corps will be announced as the Holy Name Cadets in celebration of their 75th anniversary. The corps, founded in 1934, is a nine time Drum Corps International World Champion, in addition to winning numerous state and national titles before DCI existed. 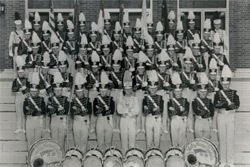 Founded as the Holy Name Cadets, the group became known as the Garfield Cadets in 1958, changed names again to the Cadets of Bergen County in 1989, and became simply The Cadets after 1998. George Hopkins, Director of the Cadets and the CEO of the parent organization, Youth Education in the Arts, said, "The Cadets are very much aware of their heritage and of the greatness the corps has provided young people for decades and decades. In marching as Holy Name, we hope to give praise and recognition not just to the members of the Cadets through 1957, but to the Garfield Cadets, the Cadets of Bergen County, and today's Cadets." The Cadets are currently planning several events to commemorate their 75th anniversary milestone in the coming year. Learn more about the organization's 75th anniversary at YEA.org.